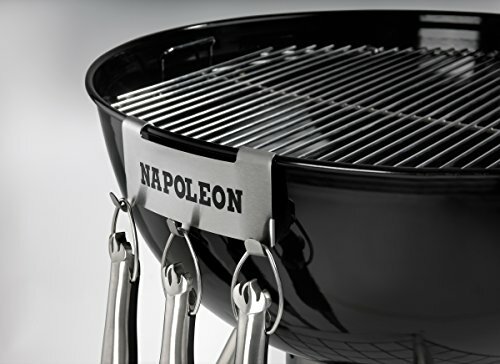 Napoleon is a company that prides itself on offering quality grills. Sometimes this means they are designing their own grill from scratch. With some of their grills like with the NK22CK-L-1, they borrow from the successful design of other manufacturers and add their own high-quality improvements. 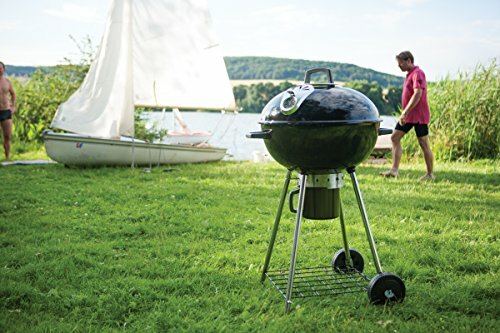 The Napoleon Charcoal Kettle Grill has a lot in common with the well-known competitors. It has the same kettle shape and lid. Yet they also go a step further. The lid, for instance, has a thermometer built into it, to let you know how your fire is doing and whether or not you need to adjust the dampers. The base has four legs instead of the competitors four. The metal of the bowl and the lid is a little thicker than the competitor’s original. There is a charcoal catcher inside the fire bowl. When properly adjusted and set in place it makes for a more consistent and efficient burn. It also helps the ash and spent embers to fall easily into the ash catcher under the fire bowl. 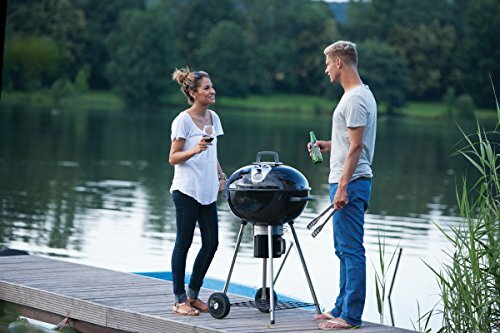 This is a bit of a copycat grill. Yet it is borrowing from a quality original from the well-known competitor and then taken up a notch. What you get in the end is a little more expensive, but you see if reflected in the durable components and materials throughout. One material flaw to be mindful of is the somewhat thin metal of the ring that binds the ash catcher to the bottom of the fire bowl. If you use water to put out the fire, or you cook a lot of things where excess marinade drips down into the bottom of the bowl, you might start to experience some rusting and corrosion issues. 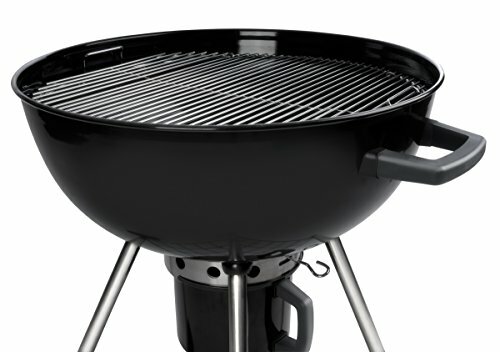 The Napoleon NK22CK-L-1 Charcoal Kettle Grill is very easy to assemble. With some basic tools you already have around the house you should be able to get it completely put together in a little under an hour. The Napoleon Charcoal Kettle Grill will do pretty much everything you expect. It can perfectly sear a steak, grill hamburger patties, and make a giant mess of bratwursts. There is also enough room on the grate and fire bowl to do some hybrid grilling. It calls for building a large, hot pile of coals on one side of the fire bowl and only a small amount of coals on the other side. If you set it up just right, you can create two heat zones. 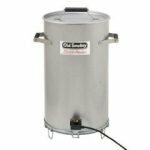 This would allow you to cool a bone-in leg of lamb or stuffed pork chops over the low fire, to cook it through without burning the outside. Then finish the meat over the hot fire. When it comes to starting the charcoal, I think you will find a chimney starter works better than the classic pyramid of briquettes soaked in lighter fluid. To do this you need to drizzle a couple of tablespoons of cooking oil onto two sheets of newspaper. Then gently crumple them into the lower chamber of the chimney starter. Place it in the middle of the fire bowl, with the grate removed. Load your charcoal into the top chamber and light the newspaper. The cooking oil will act like a candle wick slowing the burn just enough to ignite the briquettes. 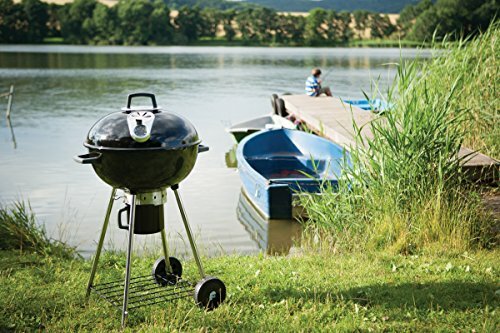 The 22-inch grill grate provides you with 365 square inches of cooking space. 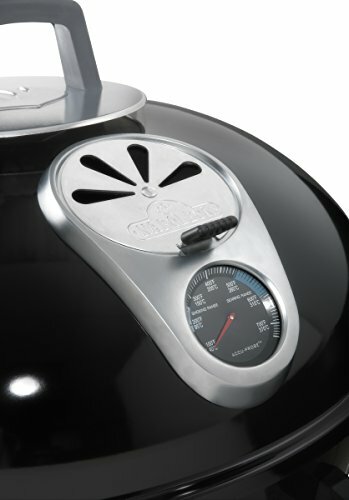 This is what you will get with any other kettle-style grill of this size. It’s worth noting that the grill grates are made from cast iron that has been treated with non-stick porcelain. This is a step better than the competitor grills, which typically offer stainless steel or chrome plated grates, with a knack for sticking! The four-legged design and the thermometer built into the lid aren’t really all that “Special.” However, they aren’t something you typically find with the original competitor. Honestly, the four legs are something you will come to appreciate. 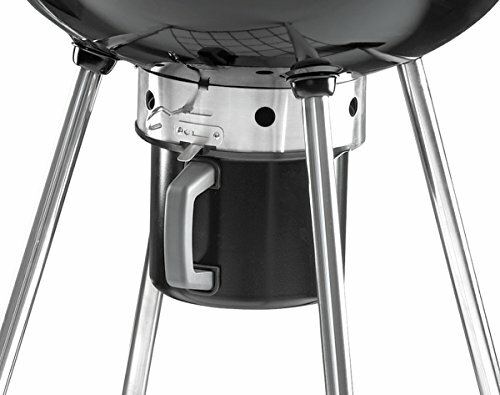 If you’ve ever stubbed your toe into a three-legged kettle grill, you know the panic that comes with trying to grab the handle to prevent a catastrophic charcoal spill! 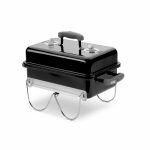 The Napoleon Charcoal Kettle grill is relatively straight forward to clean. 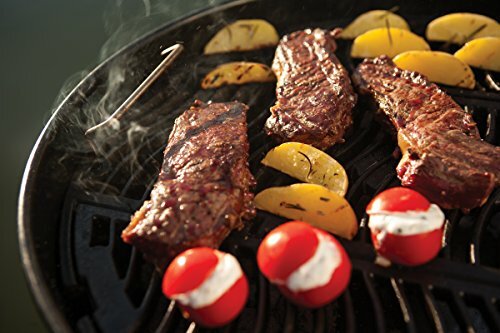 The grill grates can be a little sticky, so you will want to take time scraping them with a grill brush. If a little residue clings to the underside of the grate, you should be able to wipe it away with an abrasive sponge or some steel wool. The bottom of the fire bowl is connected to an ash catcher, which will also collect small spent embers. Sometimes the fire in the bowl will be out, yet there will still be a hot coal in the catcher. In a situation like this, it’s best to empty the ash into a metal bucket or your backyard fire pit, then pour a little water on it. You should never pour water into the ash catcher, as it could cause corrosion problems over time. 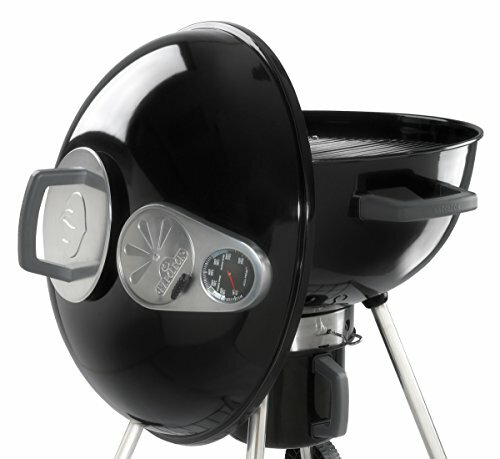 The Napoleon Charcoal Kettle grill comes with a multi-tiered limited warranty. The porcelain enamel lid and bowl are covered for 10 Years. The porcelain-enameled cast iron cooking grids have 5 years of full coverage, plus 50% off until the 10th year. All other parts and components carry a 2-year warranty. This is head and shoulders better than the competitor grills. Most of which offer a three-year warranty or a five-year limited warranty. 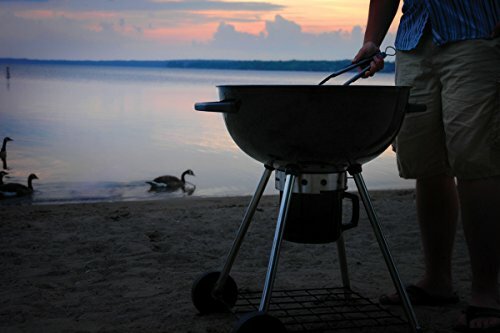 Over the years it seems like everyone has offered their own little spin on the classic charcoal kettle grill. Napoleon brings their usual quality approach to this tried and true design, while also offering some material upgrades. While this is reflected in the slightly higher price, this really is one of those times where you get what you pay for.